In the landscape of today’s business market, we see increasing demands on employers and employees alike. Often working long hours, seated or hunched over a workstation, we eat on the go, and juggle multiple responsibilities for work and home. Although a mild amount of pressure can keep us organized and meeting deadlines, constant stress and tension begin to interfere with our health, well-being and ability to remain productive. 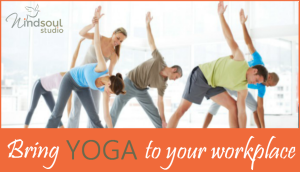 Yoga is a time-tested practice that has been proven to reduce stress, create energy and improve overall wellness. A regular practice of yoga and meditation can support our ability to stay calm and focused in the face of tension, improving the way we are able to respond to stressful challenges. 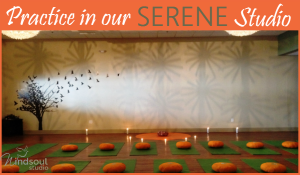 Bring yoga and meditation to your facility with our On-Site Yoga Program. 8-class commitment, weekly, biweekly or monthly. Instructors will transport mats and accessories to each class, but in limited supply. We ask that your team bring their own yoga mats, especially for larger groups. In select cases, all mats and accessories can be provided by Windsoul Studio and stored on-site. Windsoul offers a unique selection of team building activities. Whether you’re looking to drive forward the messages of working together as a team, finding balance in your workflow, mindful decision-making, creative inspiration or maintaining calm in stressful situations, we have a workshop that will suit your needs! Talk with our team about the theme of your upcoming sales or team meeting and we will provide you with a selection of fun and inspiring options, on-site or at our beautiful, spacious facility. Windsoul Studio is eager to be a partner with your organization as part of a proactive approach to employee health. Our serene 3500-square foot facility is conveniently located in Tyngsboro, MA at the border of Nashua, NH, just off of Rte 3N, exit 36. We offer classes 7-days per week, morning and evening, with up to 30 classes weekly. We provide the perfect environment for your employees to relax and refresh under the guidance of our experienced instructors, or attend one of the many special events and workshops we host with world-renowned instructors. With the Yoga & Wellness Partnership, the more employees from your team that join our studio, the more their discount increases. Contact our team to create a corporate partnership account and learn more about how much your team can save!